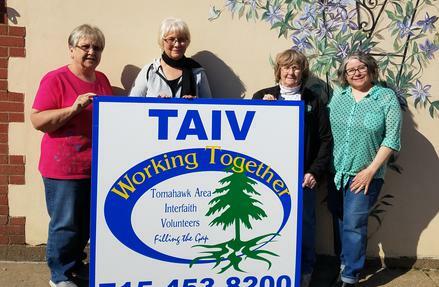 Tomahawk Area Interfaith Volunteers (TAIV), Inc., started with a group of committed volunteers who organized our non-profit organization between 2006-2007. In July 2007 the Interim board obtained a Program Director; and the organization began to recruit volunteers and care-receivers in November 2007. TAIV applied for non-profit status in December 2007 and officially receiving 501(c)3 status in early in 2008. TAIV was operating under the Tomahawk STAR Foundation, along with the financial assistance of the Robert Wood Johnson Foundation. TAIV, is governed by a Board of Directors that provides oversight and ongoing support. The Board is made up of community members from the Tomahawk and surrounding areas and meets monthly to review all business and affairs of the organization.. Churches are invited to become members of our coalition, showing support for the program through promotional activities, volunteer recruitment, financial donations and other types of support. By November 2007, TAIV had seven formal church partners.